Hurricane Irma, a category 5 (156+ miles an hour) hurricane and one for the annals of recorded history, ferociously slammed into the British Virgin Islands with a vengeance and ravaged, battered and decimated thousands of properties. However, happily, no more than four residents lost their lives. According to a recent situation report, over 4,000 properties were damaged by Irma’s strong winds and heavy rain. The cost to repair roofs, along with other damages, is being compiled. But the current working estimate is in the tens of millions of dollars to replace, renew, and repair buildings, utilities and other facilities. Top among the damages incurred were scores of roofs that experienced severe damages. 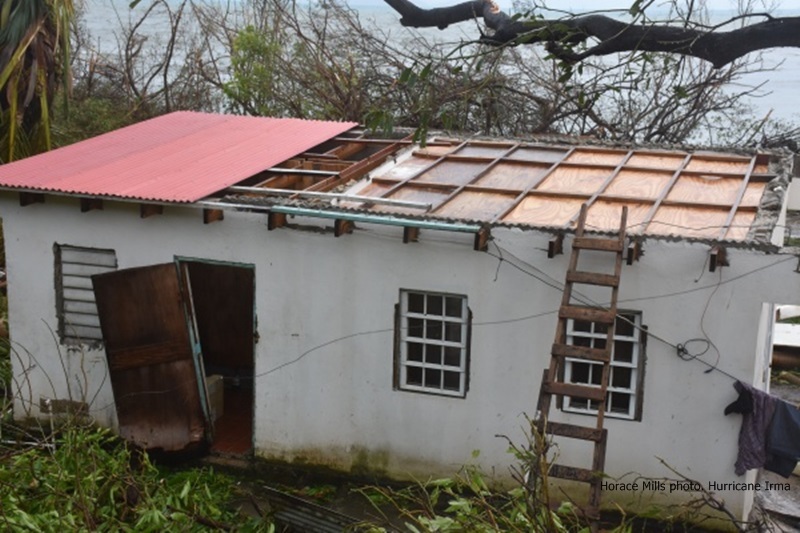 Despite the category 5 strength of Irma, the cause of roofs lifting off or blowing away needs to be assessed and corrective action taken to mitigate damages from future hurricane. In a previous commentary, a suggestion was made to review and revise the building code with a focus on three areas: roofing system, walls and wall openings, and a continuous load path. As such, in this commentary, the focus is on the roofing system; the other two areas will be addressed in future articles. Further, the roof is a vital part of the building envelope (roof, walls, and foundation), yet a vulnerable part of the building envelope. The roofing system comprise of the roofing structure (trusses/rafters), sheathing, bracing, underlayment, and coverings (shingles, galvanize, tiles). It is exposed to the element (rain, wind, heat) and is in the forefront of protecting the safety and security of building users. To assist the building envelope to stay intact with hurricane-force winds and other weather systems, it is critical that trusses/rafters are anchored effectively and properly to the bearing wall/bond beam and, in turn, the wall is anchored to the foundation to form a continuously load path. A continuous load path is also critical in keeping a building intact. Further, to avoid the roof lifting off or blowing away, the roof trusses/rafters must be anchored to the bearing wall. Roofs typically lift off, not blow away. Wind flowing over a roof surface creates a negative pressure/lifting force on the top and a positive pressure/pushing force on the bottom. This wind behaviour is similar to air flowing over an airplane wing, which results in a lifting force. Toe nailing trusses/rafters to bearing wall is not a strong and secure way to anchor them. There are special anchors on the market for connecting them to the bearing wall. Additionally, effectively connecting the roofing system to the bearing wall and the wall to the foundation creates a continuous load path. A continuous load path is important in keeping a building from tearing apart. Moreover, the roof edge and the way it is attached is important in enabling a roof to resist wind load, and keeping the roof from lifting off during hurricane force winds. Poor roof edge construction and detailing is a major contributing factor of roof failure. Roof failure permits entry of wind and increase pressure within the building and water intrusion that cause damages. Special attention must also be paid to corners; roof bracing should receive special attention. Another area of the roofing structure includes the sheathing. The sheathing should be attach to trusses/rafters with special nails (ring shank nails) or screws. Yet another focus is the underlayment and roof coverings (shingles, galvanize, tiles). Each covering must be effectively attached to the sheathing. Suggest ring shank nails or screws for shingles and galvanize. Tiles have special and specific attachment modes. Finally, though there are no absolute guarantees that a roofing system will survive a hurricane, effective construction and maintenance of the roofing system will prevent or mitigate roof damages. Roofs are a critical, structural part of the building envelope. Failure of any part of the roofing system can result in catastrophic failure of the roof, walls and other parts of building. Investing in a strong roof system is an invaluable investment. However, investing is not enough though. Roofs must be designed, constructed, and inspected to at least minimum standards or preferably well above the minimum standards set out in the building code. As a coastal community, the only option is to construct to at least the minimum building code standard. True, building properties to resist high category 3 or category 4 or category 5 hurricane winds may be cost prohibitive for many residents. However, suggest strongly recommend building a safe room in homes. A safe room is a room constructed to a stronger standard than other rooms in house and is intended to resist winds from stronger storms to protect life.